The actress Hanna Ralph impersonated very interesting characters in the 20's. To her most impressive performances belong the film classics "Die Brüder Karamasoff" (18), "Opium" (19), "Die Nibelungen: Siegfried" (24), "Helena" (24) and "Faust" (26). Hanna Ralph also acted in other silent movies like "Der Mann der Tat" (19), "Algol" (20), "Decameron-Nächte" (24) and "Napoleon auf St. Helena" (29). 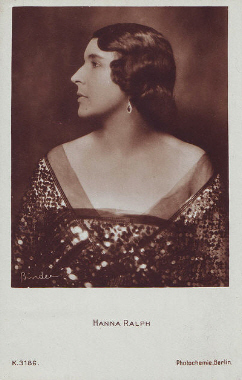 She appeared only seldom in the talkies, so in "Der König von Paris" (30), "Martha" (36) and "Der blaue Stern des Südens" (51).